From “Rushmore” to his latest, “The Darjeeling Limited,” Wes Anderson inserts us into lush and artificial places, heady imaginary worlds slathered in sizzling primary colors and soundtracked to infectious ’60s rock that courts a light-headed buzz. His ornate sets and surgical compositions are like dioramas made of gumdrops and lollipops. Be sure: They will cause toothaches. Anderson is a showman — a show-off — with a dandy’s sensibility for design and décor, a little bit of Pedro Almódovar swished with Richard Lester, lovely but spasmodic. That aesthetic hit its mark in “Rushmore,” one of Anderson’s comic masterstrokes (the other is “Bottle Rocket”), but got out of hand in the cloying “Royal Tenenbaums” and the meandering “Life Aquatic with Steve Zissou,” cutesy confections that strained to delight the Anderson cult with rampant quirks. Anderson’s a hipster nebbish, the self-conscious artist as a youngish man still locating a workable balance of personal voice and cinematic immortality. Perhaps chastened by the pallid response to “Life Aquatic,” Anderson pulls back in “Darjeeling” for something sweetly inviting. 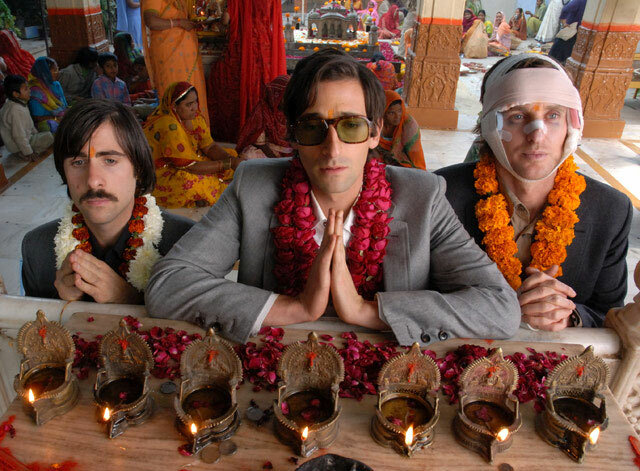 Co-written by Roman Coppola and one of the film’s stars, Jason Schwartzman — both of whom trace bloodlines to the Coppola dynasty — this yeasty picaresque about three troubled brothers on a bumbling train journey across India shows Anderson in fair control of his material. Excess gives way to highly stylized understatement, grounded by an unmistakable thrum of melancholy. In fact, the affair is so mild that Anderson’s ideas about reconciliation and healing amid a dysfunctional family (abiding themes in all his movies) don’t quite jell. When the rural Indian dust settles, it’s not clear what the characters actually accomplished in their distinctly un-mythic quest. Still, it’s a fun ride. Schwartzman, Owen Wilson and Adrien Brody make an amusing trio whose passive-aggressive deadpan is relieved by fits of brotherly scrapping. Yet we never get caught up in their professed spiritual journey or the small adventures into which they shamble.